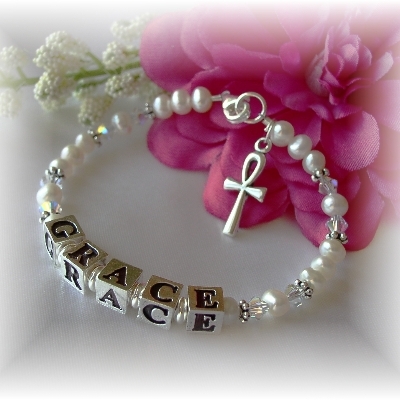 This pretty name bracelet for First Communion is created with freshwater�pearls,�Swarovski crystal accents, sterling silver letter blocks in your name choice, and a petite sterling cross charm. 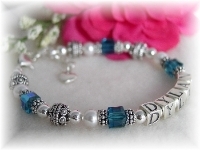 Here's a bracelet that will be loved by any girl making her First Communion! 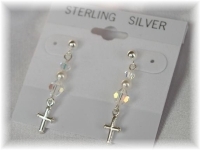 Created with petite freshwater pearls, Swarovski crystal accents* and sterling silver letter blocks as shown. Charm included. 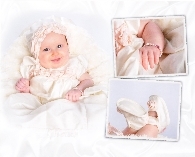 The perfect compliment to our "Grace" bracelet is the Grace Freshwater Pearl Communion Necklace! * Charms may vary due to manufacturer availability. I purchased this bracelet for my niece and it was just perfect! Not too large nor too small. She loved seeing her name in charm and the cross wasn't too overpowering either. She loves it!